With its combination of strength and beauty, maple has become one of the most popular hardwood flooring options in the United States. It’s a tough wood that stands up to decades of wear and its light, neutral color suits almost any decor style. It’s also highly affordable. Despite its popularity, though, maple does have a few downsides you’ll want to be aware of before you decide to install this flooring in your home. Even coloring gives maple a sleek, subdued look that lets your furniture take center stage. As one of the most durable and affordable wood species, it’s a practical choice for a busy home. 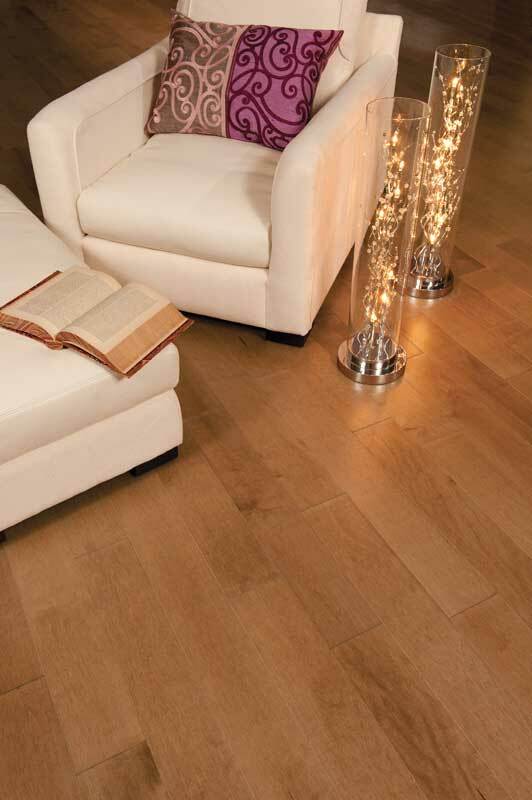 Maple’s smooth, sand blonde tones and delicate grain pattern provide a neutral base for both light and dark furniture. While it works well for traditional and rustic homes, it’s ideal for contemporary interiors that lean toward minimalism and lighter color palettes, such as modern Scandinavian, mid-century modern, and coastal. Maple takes whitewashing reasonably well, too, although it’s more difficult and expensive to do than with oak or ash. The light color also helps optimize daylight, making it a good choice for dark or small rooms. On the other hand, with little variation in color and grain pattern, maple provides the consistency needed for large spaces. Although there are several species of maple, the sugar maple and black maple are the hardest and therefore the ones used for flooring. The fact that bowling alley and gym floors are typically built from these maple species tells you all you need to know about how hard they are. Maple can easily stand up to dropped pans in the kitchen and rolling toys in the living room and kids’ bedrooms without serious damage. Maple grows relatively quickly and abundantly around the U.S., which keeps the cost of this wood low. It’s comparable in price to oak, cherry, and ash, which are also American hardwoods. Exotic hardwoods, such as teak and mahogany, will cost more. To bring your flooring costs down even further, consider second or third grade maple wood. These lower grades have some color streaks and small knot holes, but no flaws that will compromise their durability. In fact, if you’re going for a more rustic look, the irregularities of the lower grades make them a more fitting choice. As an added benefit, the fact that maple grows so plentifully makes it a more environmentally friendly choice than wood from slow-growing trees such as oak, walnut or cherry. Changing the color of a maple floor isn’t easy, and even minor damage tends to be highly visible. If the natural color of maple doesn’t appeal to you, think twice about using this wood for your floor. The tight grain of maple means the wood doesn’t absorb stain well in most areas. In those few spots that do have a more open grain, however, the stain will soak in more and create a darker color. The result is often an uneven, splotchy look. This is a particular problem when you’re trying to lighten the color of a maple floor. 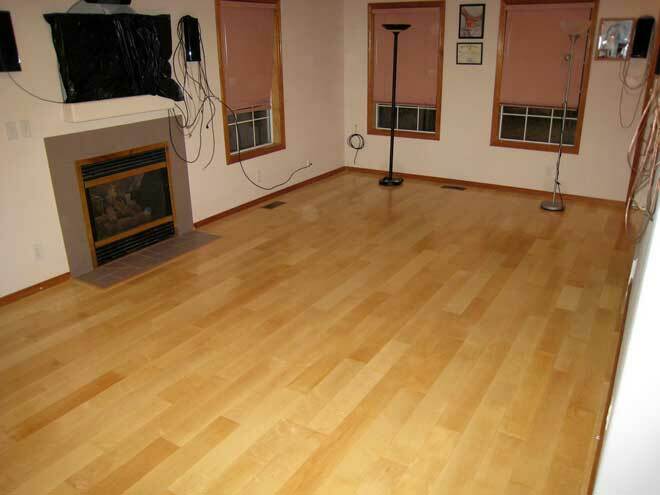 If you want a light floor, instead of staining, look for a high grade of maple, which is often nearly white. You’ll have better luck getting an even finish with a darker stain, but a dye is ultimately a better option. Both staining and dying maple are tricky jobs best left to a professional. The hardness of maple helps it resist scratches, but when a scratch does show up, it will stand out more against maple’s smooth grain than on a wood with a more complex, prominent grain. To keep your floor looking good, apply a protective seal in areas that get heavy foot traffic. You can then use a wax rubbing compound to polish out small scratches. If you want to keep your floor looking pristine, maple isn’t a good choice for busy areas or anywhere the kids will be dragging their toys around. Heavy use won’t cause serious damage, but over the years, it can lead to a collection of visible superficial dents and scratches. As you might have noticed on gym floors, rubber soled shoes tend to leave dark scuff marks on maple. Just rubbing the spot with an eraser or even your shoe should get rid of these marks. While maple is hard, it’s not as stable as some other woods. That means it’s more responsive to changes in the environment. Dramatic fluctuations in temperature or humidity, such as in extremely damp or dry climates, can cause the floor boards to shrink, warp or split. You can protect your maple floor by keeping the room at a more or less constant temperature and humidity level, which might mean using a humidifier or dehumidifier. Incorrect drying and careless storage can also leave maple flooring prone to damage, so when you buy, choose a supplier who can guarantee the wood has been handled correctly. 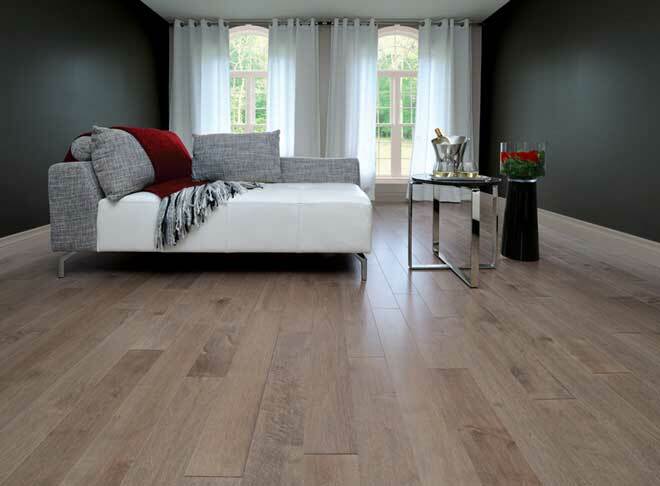 Maple’s simple, understated beauty has made it an enduring classic and a particular favorite for contemporary homes. Its modest price has helped its popularity too. As one of the hardest wood species used in flooring, maple is highly durable as long as you don’t mind the risk of superficial scratches and you can keep your home’s humidity under control. If you prefer darker flooring or appreciate the complex grain patterns in wood surfaces, however, you might be happier with walnut or cherry, rather than maple. In a very dry or humid climate, a wood species better suited to your environment will be a more practical choice.